The skies above Guiana Space Centre’s launch pad ELA-3 came to life for the second time in 2016 at 12:20 a.m. EST (05:20 GMT) with the powerful roar and blinding light that marks the launch of an Ariane 5. The mission, designated VA229, successfully inserted the Eutelsat 65 West A satellite into a geostationary transfer orbit (GTO) on March 9. It is headed for an operational geostationary orbit at 65 degrees west longitude above Central and South America. The satellite was sent aloft to bring satellite television and better internet connectivity to the Caribbean, Central America, the Andes, and Brazil. The massive 173-foot-tall (53-meter-tall) rocket was rolled out to the Ensemble de Lancement Ariane 3 (ELA3) on Monday, March 7, and was promptly fitted with the various communication arrays, sensors, and fuel pumps at the pad. This site is specially outfitted for the Ariane 5 family of rockets, and it is where the final stage of launch preparations took place. At this location, the rocket’s main cryogenic stage had its tanks filled with about 175 metric tons of propellant—150 metric tons of liquid oxygen and 25 metric tons of liquid hydrogen—on the day of launch. The Ariane 5 is a two-stage booster, composed of the Etage Principal Cryotechnique (EPC)—Cryotechnic Main Stage—which is powered by a Vulcain 2 rocket engine, and two Étages d’Accélération à Poudre (EAP) solid rocket boosters. The two EAPs are capable of producing a total of 2.43 lbf (10.8 MN) of thrust—92 percent of the thrust required to carry out the mission. The upper stage of the rocket is composed of the Etage Superieur Cryotechnique (ESC)—Cryogenic Upper Stage—powered by an Aestus rocket engine which is capable of being restarted. The upper stage also houses the Vehicle Equipment Bay (VEB) which carries the Eutelsat 65 West A in the Système de Lancement Double Ariane (SYLDA) payload carrier. The launcher carried a total payload of 14,771 pounds (6,700 kilograms). As the countdown reached zero, the Vulcain 2 engine, named after the Roman god of fire, roared to life, putting out over 300,000 lbf (1,359 kN) of thrust. Approximately seven seconds after ignition of the main engine, the onboard computers, sensing that all was well with the Vulcain 2, sent an activation command to the two EAP solid rocket boosters—propelling the rocket off the pad and into the skies above the Amazon. Seventeen seconds into the flight, the Ariane 5 began to roll into the correct flight path on a trajectory out of the atmosphere and into orbit. After two minutes and 24 seconds of powered flight, the two EAP solid rocket boosters separated from the main stage, shedding 1.21 million pounds (550 tonnes) of the total weight of the Ariane 5. Three minutes into the flight, with the rocket most of the way out of Earth’s atmosphere, the protective fairing was jettisoned, shedding an additional 4,000 pounds (1,800 kilograms) off of the main stage. After about eight minutes of flight, the Vulcain 2 engine was shut down and the ETC main stage was separated from the ESC upper stage. A minute later, the ESC’s Aestus engine ignited, marking the final stage of the mission as the ESC brought Eutelsat 65 West A closer to GTO. Twenty-four minutes into the mission, the ESC ended its thrust phase, bringing the Eutelsat 65 West A satellite into insertion range of its target geostationary orbit. Five minutes later, the Eutelsat 65 West A was successfully released from SYLDA, marking the successful end of the second mission of 2016 for Arianespace. This mission was also the second time a spacecraft rode to orbit in the SYLDA payload carrier as the heavy-lift launcher’s only passenger—a departure from the usual dual payload launches the Ariane 5 carried out in 2015. Eutelsat 65 A was built by Space Systems Loral (SSL) in California and is based on the SSL 1300 satellite platform. 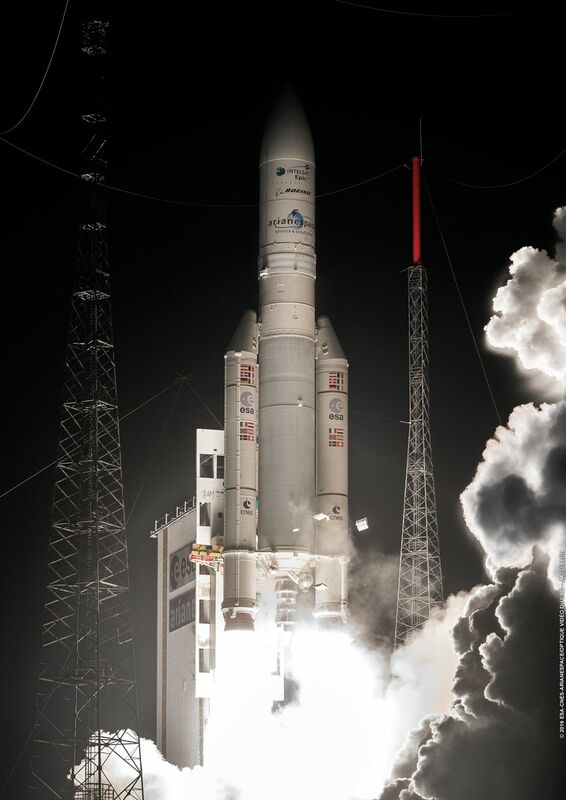 This payload was the 31st Eutelsat and 53rd SSL satellite launched by Arianespace. It is set to provide satellite television to Central America, the Andes, the Caribbean, and Brazil—just in time for the 2016 Olympics in Rio de Janeiro. This was the second mission in what will be a busy year for Arianespace as the company sets a new objective of 12 launches, including as many as eight by the Ariane 5. The next Ariane 5 flight, designated VA230, will be carrying the Echostar-18 and BRIsat satellites into orbit on June 7.